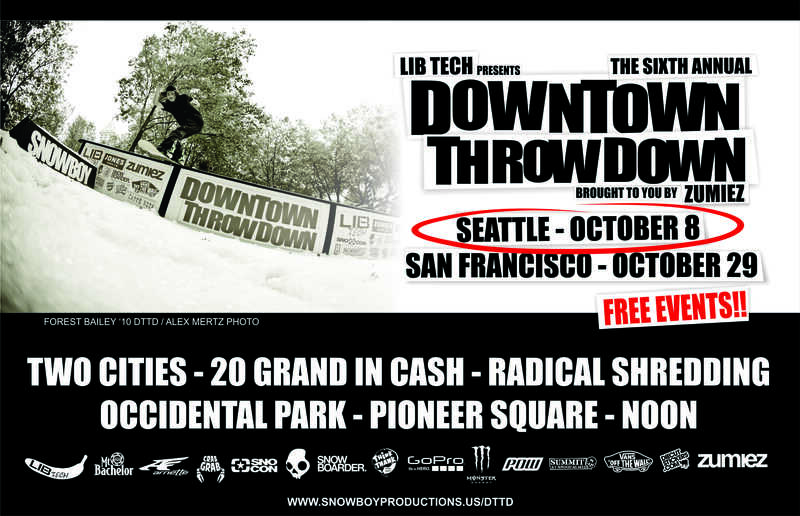 Lib Tech and Snowboy Productions are stoked to bring back the Downtown Throwdown to Seattle on October 8…it’s gonna be BANANAS! With the more snow in Pioneer Square than Seattle will see all year, this event has grown from a great local event to the biggest and most respected urban snowboarding event in the world. 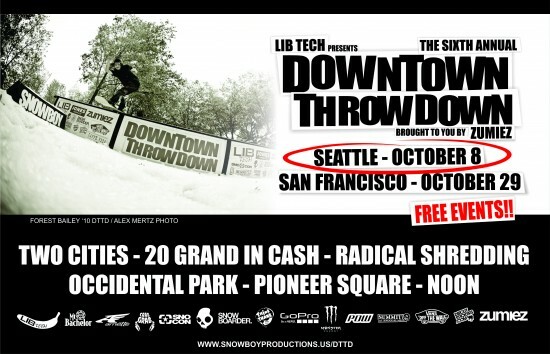 25 of the biggest up and coming names in snowboarding will compete in a 2 hour free-for-all for a share in $10K in cash! The invite list is STACKED with the likes of Scott Stevens, Forest Bailey, Johnny Lazz, Ted Borland, Jake Kuzyk, Dylan Thompson, Austen Sweetin, Jess Kimura and a lot more. We can’t wait to see who will join Dan Brisse, Jed Anderson (twice), Nick Visconti and Ryan Paul as the next Downtown Throwdown champ. In addition to the non-stop shred action, there will also be music, Cobra Dogs and other food vendors, live art by Lib Tech’s Quincy Quigg, a raffle of great prizes that benifits tSB (www.theserviceboard.org) as well as info and prizes from all our great sponsors. Best of all? It’s still TOTALLY FREE AND BENEFITS TSB!! So get down to Pioneer Square and check out the action!